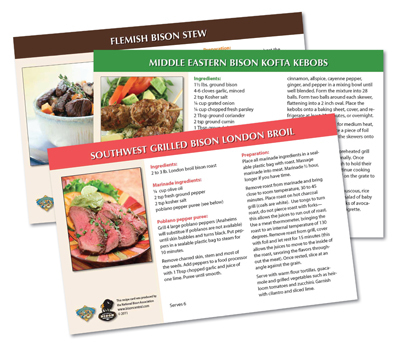 Beautiful food images, easy to follow recipes and a wide variety of bison cuts make these recipe cards a practical and valuable item for your clients purchasing bison meat. Cards feature recipes that both novice and adventurous home cooks will love. Recipes include classic favorites such as bison chili and short ribs, avors from around the world like Mediterranean bison salad and kofta kabobs and decedent steak with wine and berry glaze. These recipe cards showcase the versatility of bison meat in a delicious way!